Llaros Uvayn is a Dunmer nightblade in the service of Cunius Pelelius, Governor of Caldera. 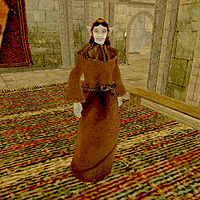 She is an Oathman of House Hlaalu, but will offer you spells for sale whether you are as well or not. She wears a common robe with matching shoes. She also carries a dire viperblade and up to 30 gold. This page was last modified on 23 November 2018, at 07:24.